Why do mycoplasma contamination rates remain high? | Bionique® Testing Laboratories, Inc. The absence of any visible signs of mycoplasma contamination, such as cytopathogenicity and changes in turbidity or pH (even in heavily contaminated cultures), leads to a false sense of security (Figure 3a). As a result, some mycoplasma contaminated cultures have unknowingly been used in research for years. However, although they may be unseen, mycoplasmas still have serious effects on the key characteristics and functions of the cells and compromise any research done with them. 2. Many researchers still do not test their cell cultures for mycoplasma. 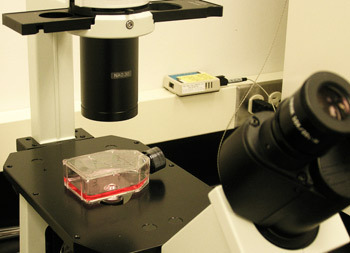 Microscope with flaskcultures for mycoplasma. Published surveys have demonstrated that the prevalence of mycoplasma contamination is much higher in laboratories and facilities that do not have established testing programs. A study originating from the former Czechoslovakia revealed a marked discrepancy in mycoplasma contamination rates from laboratories without mycoplasma testing programs (100%) compared to labs that tested regularly (2%)(Ryan, 2008a). Cell lines transferred to an individual laboratory from outside sources, especially from colleagues, may be mycoplasma positive even though they appear normal and healthy. Cell lines which are not directly obtained from reputable cell repositories distributing certified contamination-free lines need to be quarantined and tested for mycoplasma before use in research or biomanufacturing. Once present in the laboratory, a mycoplasma infected culture can quickly cross-contaminate other cell lines in use (McGarrity, 1976). 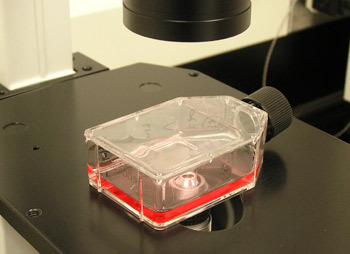 However, numerous techniques for mycoplasma testing have been developed which can meet the scientific or regulatory requirements pertaining to individual cell lines or cell derived products. 3. Reliance on antibiotics instead of good aseptic practices. Mycoplasma contamination rates are much higher than average for cell lines routinely grown in antibiotic-containing medium (Barile, 1973). In most instances, the mycoplasmas typically have partial or complete resistance to the antibiotics which are selected, such as penicillin and streptomycin. Consequently, this practice provides an opportunity to introduce mycoplasma into these cultures undetected. Overreliance on antibiotics can also promote the emergence of antibiotic resistance. This important topic is covered in more detail in the next FAQ, Why does overuse of antibiotics result in higher mycoplasma contamination rates? By understanding the cryptic nature of mycoplasma, implementing a quality mycoplasma testing program and developing stringent aseptic practices, it is possible to reduce the potential of mycoplasma from becoming a major problem in your laboratory or facility. These strategies will reduce the risk of contamination, promote early detection and prevent cross-contamination of mycoplasma-free cultures in your laboratory. The remaining Mycoplasma FAQ's will help improve your understanding and provide some practical ideas on managing this potential culture problem.